Meg's Food! 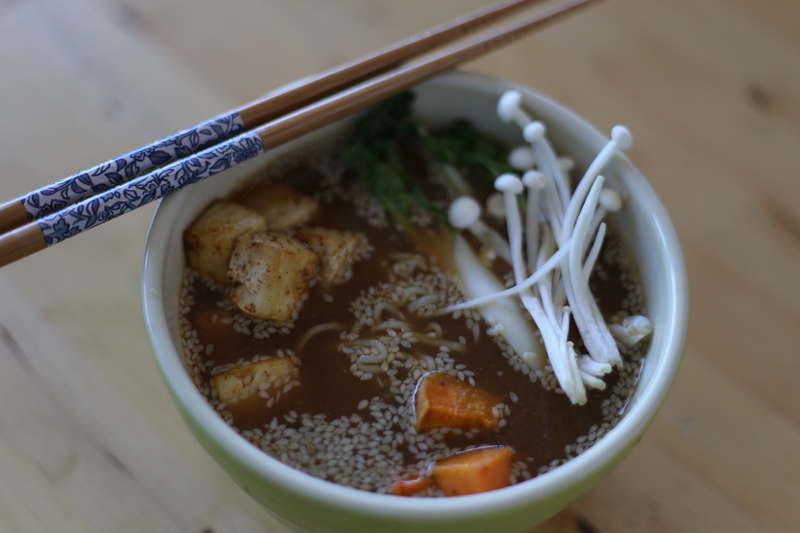 | Vegetarian Ramen - Meg's Food! Ramen is the perfect meal for days like this week, where the highest temperature you’ll feel is -12. But vegetarian ramen can be hard to find. In Toronto there are a few places that do it right, but most ramen places don’t even have a veggie option. And at home, it’s hard to get right – you need the broth to be rich, savoury, umami – sometimes hard to achieve using only plants. But after lots of experimenting. I think I’ve found one that works for me. You can find recipes online for veggie ramen that use upwards of 20 ingredients and have so many steps you’ll be in the kitchen all day, and while I’m sure they taste phenomenal, I don’t have time for that life. So this recipe is a nice happy medium – you spend some time building in flavour, like making your own broth (absolutely essential!) and roasting veggies to add that depth of flavour you’re looking for – but it won’t take you all day to make. 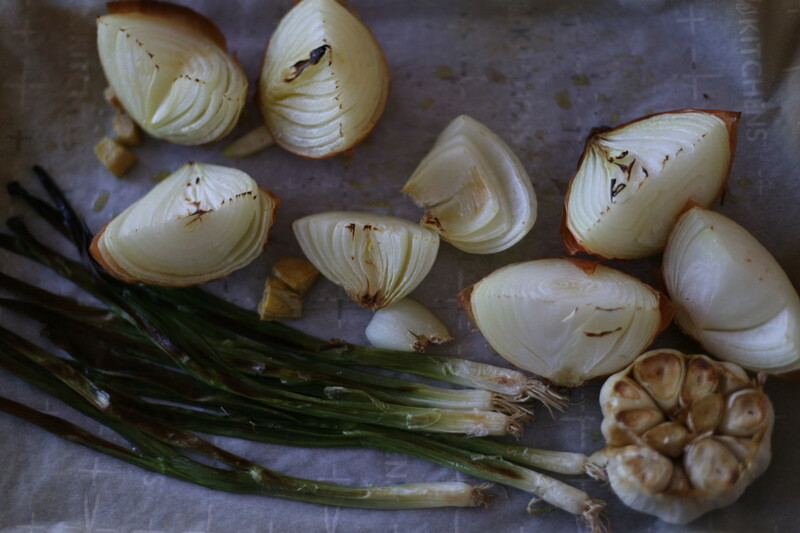 The broth is really the key here – you roast the onions, garlic, and ginger, to start with an amped up flavour base. Then you add pulverized shiitake mushrooms that’ll infuse the whole broth with that rich shiitake flavour. I use red miso paste because I love the more intense flavour, but you can use yellow or white, you just will have a milder-tasting soup base. Add even more richness to your soup base by blending in roasted garlic and sweet potato – it’s a great trick to make it taste like you’ve been simmering that broth all day! For noodles, you can use whatever ones you like. If you are lucky enough to be able to find fresh ramen noodles use those – they’re amazing. If not, dried will be ok as well. Toss whole green onions, quartered yellow onions, and ginger in oil and spread out on a baking sheet lined with parchment paper. Cut the tops off the heads of garlic and add to the baking sheet. Heat oven to broil, and broil until veggies are nicely charred, about 10 minutes. Turn oven to 400 for the tofu and sweet potato. In a blender, pulse dried shiitakes until they’re completely pulverized. Add one cup of water and pulse until combined. Add to a large soup pot, along with 7 more cups of water, and kombu strips. Add onions/garlic straight from the pan (with skin still on). Bring to a boil, then reduce to a simmer, and let simmer, covered, at least 30 minutes (the longer you simmer, the more flavour the broth will have). Meanwhile, peel and slice sweet potato into cubes, and drain tofu and slice into cubes. Toss with some vegetable oil, chili flakes, the minced garlic, and sea salt. Turn out onto a baking sheet and roast until tofu is golden and crispy and sweet potatoes are soft, about 35-40 minutes. Once the sweet potato and tofu have finished roasting, set aside 1/2 cup sweet potato. Strain the broth, saving the garlic heads. Add about one cup of broth to a blender, and squeeze the cloves of garlic out of the skin into the blender with the broth. Add miso paste, tamari, sesame seeds, and the 1/2 cup of roasted sweet potato. Pulse until combined, then stir this into the rest of the broth. Meanwhile, bring a pot of water to a boil and cook ramen noodles according to directions. Add sliced baby bok choi in the last minute of cooking. Drain, and add to broth. 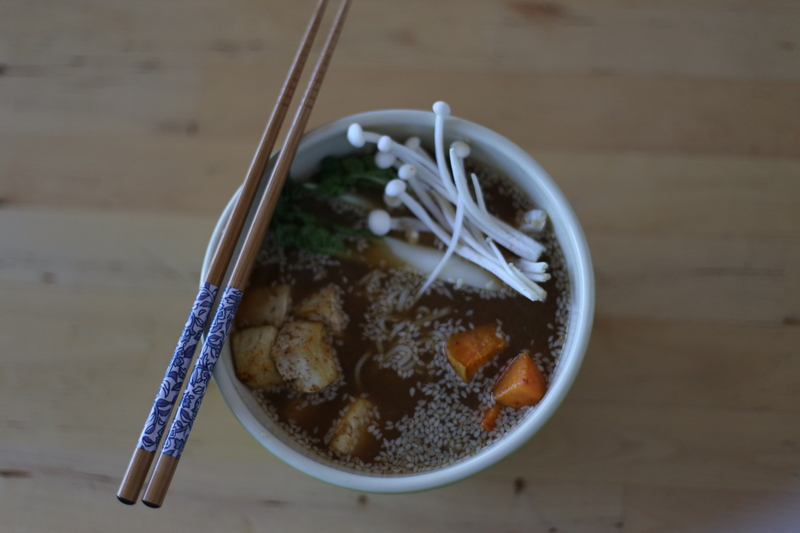 To serve, top ramen with enoki mushrooms, roasted sweet potato, and roasted tofu. This entry was posted in Dinner, Lunch. Bookmark the permalink.